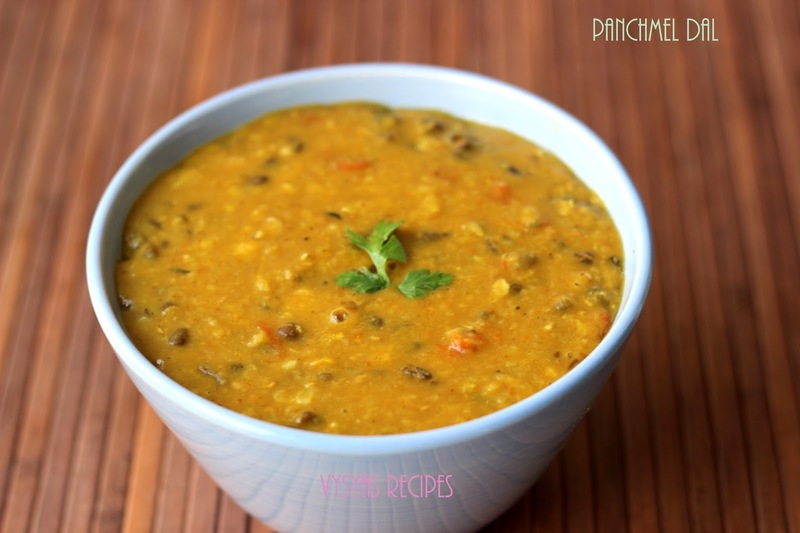 Panchmel Dal is a traditional,healthy,Popular Rajasthani dal Recipe,made with a combination of 5 dals. Dals are cooked till soft, then it is mashed & tempered with spices.This is an Nutritious Side Dish Recipe, as it is Packed with High fiber & protein Content. This dal Recipe is a Good Accompaniment for Chapathi,Roti,Phulka's,Dal Bati, Rice & Jeera Rice.This is an No Onion No Garlic Recipe. Soak the dal for more than one Hour. Pressure Cook the dal with 4 cups of water & 1/4 tsp of turmeric for 4 -5 whistles, till soft.When Pressure Subsides,open the lid & mash the dal. In another Pan, heat the oil or Ghee, add cumin seeds,when it sizzles add Cinnamon,Cardomom,Cloves & Red Chillies.Saute till aromatic. Then add Grated Ginger & Green chillies.fry for 2 minutes. Then add finely chopped Tomatoes, Coriander Powder,Chilli Powder,Garam Masala. Then add the fried tempering mixture over the dal & cook for 8 - 10 minutes, in a medium flame till it gets Creamy Gravy Consistency. While Serving Top the dal with Butter or Ghee. you can add 1 tbsp of crushed Kasthoori Methi for Garnishing. 1 cup of dal = 250 ml. Adding Whole Spices gives Nice flavour to dal. This is one of my favorite dals. Yours look perfect.